Club chairwoman, Vicki Deritis, experiences the thrills and spills of the Thrunton Thriller Trail Run. In a fit of race entering over the New Year period (New Year, new me; that sort of thing), I signed up for this one. 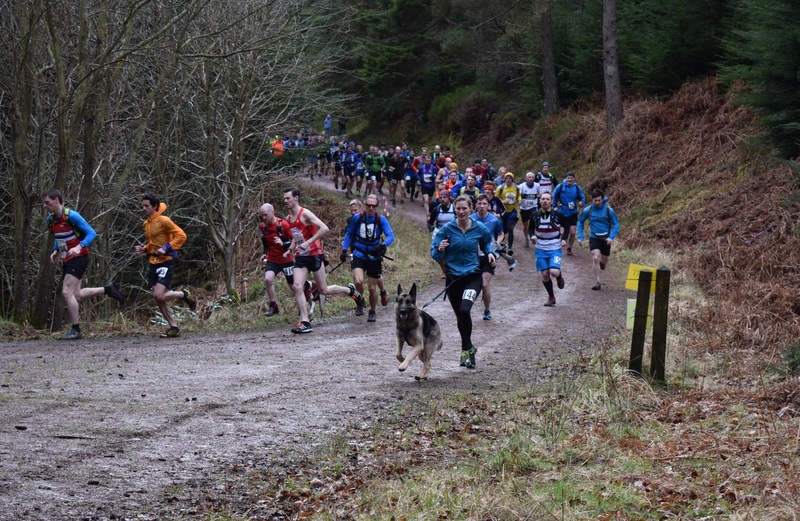 Described as a 10k trail race ‘around a special place, renowned for it’s great walking, dramatic crags and far off views of the Cheviots’ with the added bonus that you could run with your dog, it sounded exactly like my sort of thing. According to the pre-race instructions there were a number of mandatory kit items to be carried. These included usual stuff like waterproof/windproof covering and a map but, less obviously, water. Really? This is Northumberland in March we are talking about here not the Kalahari desert. There was no requirement for the usual FRA items of a compass, hat and gloves but I popped them in the rucksack anyway along with the likely number of dog poo bags necessary. I ain’t a stick and flick kind of girl. Sitting in the car and keeping warm before the start we noticed that your average punter at a trail race was different from the common or garden types normally seen at most North East fell races. There was a good mix of men and women with a wide age range. There was also lots of kit. In fact, more kit than you could shake a stick at. It was kit heaven. There was a distinct lack of gnarly old men who’d be running in just vests and shorts although I was sitting next to one of these rare specimens in the car. There were also dogs. Quite a lot of dogs. They were also embracing the kit market with fancy harnesses and leads.These weren’t just your bimble round the park kind of dogs. These were action dogs and they had the gear to prove it. After a race briefing accompanied by a cacophony of excited, expectant barking (to which my four-legged friend pleads guilty, m’lud), the race started at 9.30am. As well as the 10k, there was also a half marathon. Both races started together on the forestry road but the routes split after about 200 metres. Immediately we started climbing and the road quickly became a wide path which not long after became a very steep and narrow path complete with stones and tree roots. No one was running now and the tight path meant overtaking was very difficult. I found it helpful to keep my gaze fixed solely on the floor a) to avoid taking an early tumble and b) so I couldn’t see just how far up the path kept going for. The next bit was a mixture of forest roads and narrow descending paths through forest. The latter apparently being very technical mountain bike routes. Good luck with that. Whilst making my way less than nimbly down through the forest I was overtaken by the lead runners in the half marathon whose route had now re-joined ours. The trees parted for a bit and I could see to my left what looked like Himalayan peaks bereft of their snow. Okay, that may be a bit of an exaggeration but they were big. 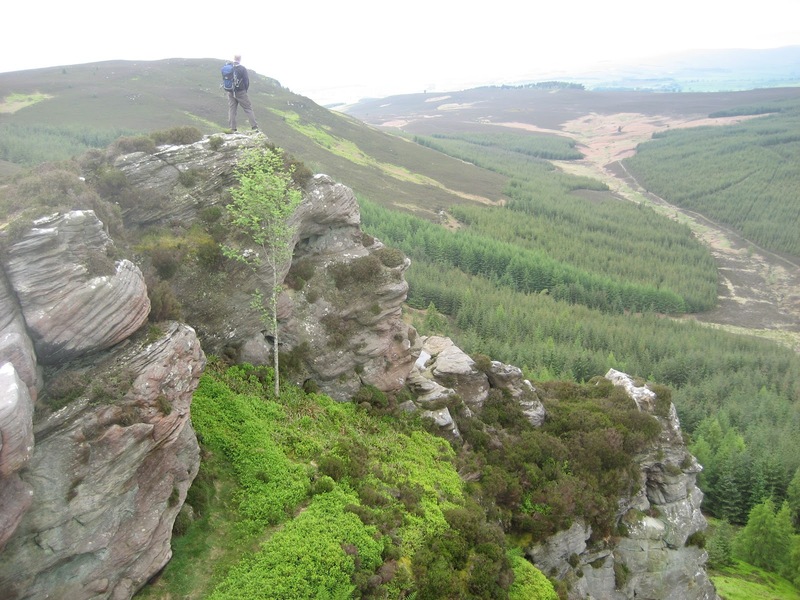 Coe Crags and Long Crag. I’d known we were going to go up them but I’d not really given much thought to what that would mean in practice. Answer – a bloody long climb. But before the climb, we had a water jump to negotiate. It may well be that some athletic types barely got their heels wet but, being as aware of my limitations as I was of the photographer strategically positioned on the opposite side of the stream, I went for the jump in up to my calves and wade across approach. Far from pretty but an altogether safer option. Then the climb started and it kept going and then it went on some more and then just when you thought it might be over, nope, it carried on again. First, a wide path and then a narrow path containing serious amounts of mud. Mud was to be very much the defining feature of the second half of the race. The trees cleared and the views opened out across Northumberland. I’m sure they were very nice but I was now concentrating fully on feet placement. I’d envisaged that once up on the top I’d be running freely, wind in my hair (bit of poetic licence here) between Coe Crags and Long Crag but no. I’d sort of been imagining the flagstones and grade A paths at the top of nearby Simonside but, instead, it was a superhighway of deep mud now churned many times over by the runners who had passed before me. Progress was difficult and slow. The strong wind didn’t help and I was grateful that I had opted to wear a t-shirt under my vest. The two marshalls braving the elements on the ridge certainly drew the short straws when High Fell Events had been divvying out the marshall posts but they were cheery and it was a relief to hear the second one say ‘big descent now’. He also mentioned ‘be careful of the rocks’ which, as it turned out, were words I didn’t pay enough attention to. Now I always think that for someone of my speed, I’m not a bad descender. When travelling downhill, I am more likely to overtake than be overtaken. However, today there was a significant variable thrown into the usual equation. Dog. A fast dog. A dog that had, maybe, become a little bored of dawdling along with me. A dog attached to me via a waist belt. Now Finn has his uses. I cannot deny that, on occasions, a little bit of towing may have taken place when going uphill. Going downhill on a narrow, steep and rocky path in tandem with a keen dog is altogether more problematic. At the same time as repeating ‘Heel’ and ‘Wait’ punctuated by various expletives, I’m trying to move as quickly as I could whilst trying to ‘be careful of the rocks’. The inevitable happened and, after several near misses, I took a tumble. I went down with a thud and, whilst ultimately I have nothing more to show for it other than a disappointingly small bruise on my leg, it must have looked dramatic as several concerned runners asked if I was okay. Up and running ( I use that word in it’s loosest sense) again, I made my way towards the finish. Mud and bog. Bog and mud. Oh look, more mud and bog. 10k had come and gone on my Garmin and I knew I was still a good distance from the finish. Fortunately, I had been given the heads-up that, in the previous year’s race a different 10k course had ended up being around 8 miles so, whilst I wasn’t surprised, the extra mileage was something I could have done without. Eventually, I was back in the trees and heading down. The finish line was no more than a mile away. It had been at around this point earlier and, at the business end of the 10k, that that gnarly fell runner, whom I happen to know quite well, had been cruising to a third place finish and first V50. You know those fell runners. Skilled at navigation and all that. Nevertheless, he thought now had been the right time to commence his Grand Tour of Northumberland eventually finding himself beside the village of Callaly about a mile away. After he made his way back up to the course, he decided he enjoyed the off-piste experience so much he went walkabouts again. In fairness, it turned out that a large number of runners at gone wrong at the second point and there may have been an issue with signage there. However, the first AWOL was entirely his own work. The race had, what I thought to be, a rather odd finish. Some described it as a sting in the tail. I’d say it was contrived and unnecessary. Just as you’re on a forestry road heading towards what you think is the finish you are directed off the road back up a sharp incline of felled forestry before being sent back down it again.. The finish was as you emerged from the trees and probably no one than a handful of yards from where you had been directed off the road. Why? I have to admit that this race was far harder than I expected. I had done the Brough Law fell race the week before and that had been a stroll in the park compared to this one. Although the amounts of ascent were not dissimilar (Brough Law 1312′ as against 1300′) Brough Law was on runnable grass whereas here the conditions underfoot made the experience far more challenging. I finished in 2:25:30 for a course that my Garmin measured at 14k. The winner finished in 1:22:20 and the first female in 1:41:05 which, I think, gives an indication that this was not a bog standard race although actually, come to think of it, that’s exactly what it was. In addition to myself and the gnarly fell runner (who finished in 1:52.52) there were 3 other Tyne Bridge Harriers there and well done to them. Chris Chase and Yvonne Huebner also did the (alleged) 10k finishing in 1:52:38 and 2:27.49 respectively. Much respect to Jill Anderson who did the half marathon finishing in a commendable 4:26:20. Jill had said to me pre-race that she had never done anything like this before so I’m assuming it was her first trail race. I hope it will not be her last! Would I do it again? I don’t know. If you are going to insist that kit is mandatory and that there will be kit checks then it is a little galling to see a number of people running without rucksacks or bumbags. Having a course map available on-site is a fairly basic ask. The goody bag was distinctly lacking in goodies and my medal ended up where all my medals go. Straight in the bin. However, it was a friendly event organised by a local company. The entry fee was a modest £16 with an optional £3 for a t-shirt. There were food and drinks at the checkpoints and the loos were clean and there were lots of them. Teas, coffees and cake were available at the finish for a modest cost. The race gave it’s competitors the chance to run around one of the most beautiful counties in England. In the end, I think the decision whether to do it again would be dictated by what other events I’d like to try. So many races, so little time. 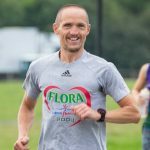 What a race report! I haven’t laughed so much in ages (and no, not at your unfortunate tumble Vicki). Big thumbs up to everyone who took part in the race as it sound’s like it was truly awful to run in. Hope you weren’t laughing at me going awol DD. It wasn’t awful at all, just Vicki being a drama queen. What a great read – you are quite the talented blogger Vicki. A fad from big-standard bit of journalism!